U.K. Offers Famed Arctic Shipwrecks As 'Exceptional Gift' To Canada : The Two-Way British explorer John Franklin died in Canada's northern reaches in the 1840s, along with all of his crew. Only recently were his ships finally found. Now, they are a gift from the U.K. to Canada. 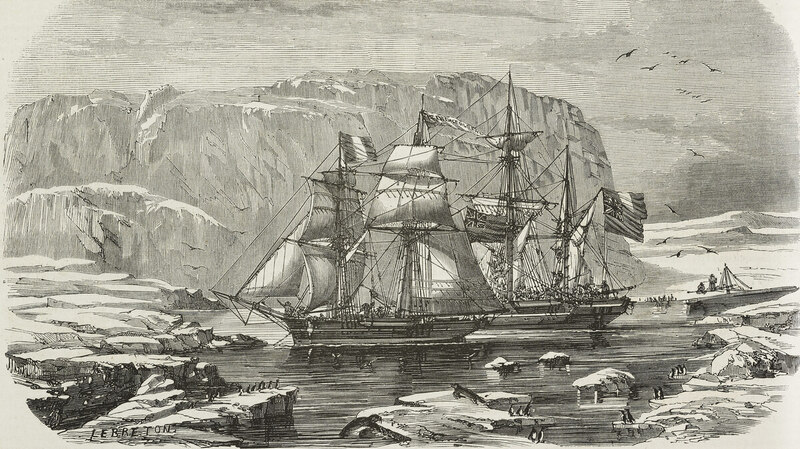 The HMS Erebus and HMS Terror in the bay where John Franklin's expedition spent the winter of 1845-1846, as illustrated by Le Breton in 1853. In an act befitting "our long shared history and the closeness of our current bilateral relationship," the U.K. has announced it will give Canada the recovered shipwrecks of John Franklin, a British explorer who sought to chart an unnavigated section of the Northwest Passage in the Arctic in the 1840s — and died in the attempt, along with all of his crew. "This exceptional arrangement will recognise the historical significance of the Franklin expedition to the people of Canada, and will ensure that these wrecks and artefacts are conserved for future generations," British Defense Minister Michael Fallon said in a statement published Tuesday. For more than a century and a half, the resting place of the two vessels remained a mystery — until a team of archaeologists finally found and identified the HMS Erebus in 2014. Just two years later, researchers acted on a tip from an Inuit man to find the HMS Terror, the flagship of Franklin's 1845 expedition, sitting "perfectly preserved" nearby in the waters near King William Island. "Sir John Franklin and 128 crewmen were lost in the original expedition. Skulls believed to be of the members of the expedition were found and buried on King William Island in 1945. "But for 167 years it has remained a mystery as to why Franklin and his men were never heard from soon after the Royal Navy had mounted one of the best equipped Arctic explorations in its history to find a possible trade route between the Atlantic and Pacific oceans." "This was the great mystery of the 19th century, certainly for the British," novelist Dan Simmons, who wrote a fictionalized account of the expedition, told NPR's Rachel Martin last year. "They kept hunting for those lost ships for the rest of the century right up to the 20th century." That did not prevent the British from preparing for the possibility of their discovery. In 1997, before either wreck was even found, the U.K. and Canadian governments negotiated over who would get them ... assuming they ever resurfaced. The British defense ministry says that at the time, the two countries agreed Canada would get "custody and control of the wrecks and their contents," while the U.K. would retain ownership of them. Now, they serve as an "exceptional gift to Canada." "The transfer of ownership is expected to be undertaken over the coming weeks," the ministry adds.